The mini-Viper Titanium Money Clip by Superior Titanium Products, Inc. The mini-VIPER™ Titanium Money Clip is a smaller version of our popular VIPER™ Titanium Money Clip. 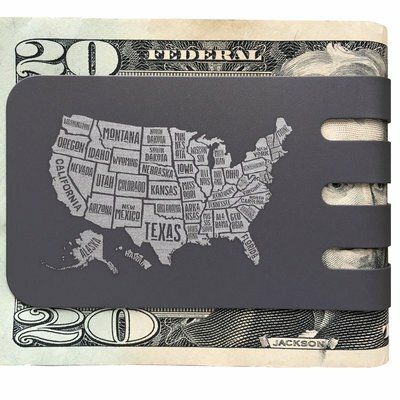 This premium money clip is engineered to hold up to 30 folded bills (that is the equivalent thickness of 60 unfolded bills!). 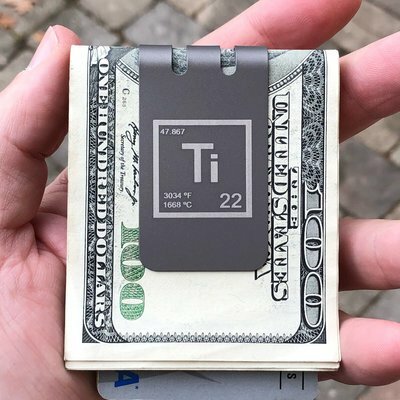 Of course all this is good, but what makes this titanium money clip great, is that it springs back precisely to hold just a single bill! TOUGH - COMPACT - PROVEN! 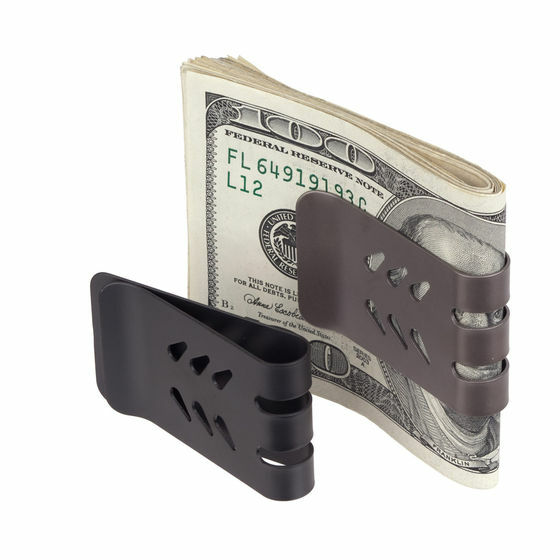 We designed this money clip to fully utilize titanium's strength, toughness and extreme resistance to fatigue. 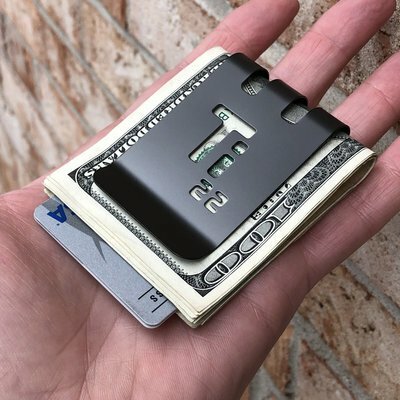 The mini-VIPER™ Titanium Money Clip is a mid-sized money clip that takes control of your cash and credit cards with three power bands of titanium. The mini-VIPER™ Titanium Money Clip TM has bite! The mini-Viper™ Titanium Money Clip and has been specifically engineered to perform not only today, but for a lifetime and beyond. We use 100% American titanium for the best quality and all manufacturing is done in the United States and Canada. Every purchase is supporting American and Canadian workers and our high end aerospace supply chains. We hope you enjoy the unique design and welcome any and all feedback! A link back to our site is also very much appreciated. Carry the mini-viper w/ bills only, daily, for 2 years now.. Outstanding! Approaching 60 years of age & embarrassed to say how many different clips I've tried. I have other clips by you as well. They all work, but this one works the best for me. Great job! Can't imagine a better clip..
Read the compliments about your mini money clip and I just want to add that I think it's the best one on planet earth, EVER! I'm 75 and have searched for many years for a clip that really retains its integrity, and THIS IS IT! PERIOD! I actually received a viper mini as a Christmas gift after begging for it from my brother-in-law. I just have to say that I absolutely love it. I have bought 12 wallets and 4 money clips over the past 6 years. This is finally what I was looking for...something small, economical, and practical. Something that fits in my pocket without causing a large bulge, but something that holds enough that I don't feel like I have to spend money to get down to my money clip's capacity. Well done...seriously. This is one of the best products I've found in the past decade. Just wanted to let you know that I received my mini viper money clip yesterday. I love love love it! Exactly as described online and in the videos. Thank you again for your outstanding level of customer service. 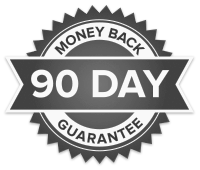 I'll be a repeat/loyal customer for sure! 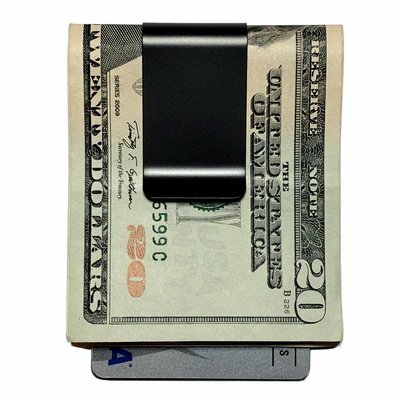 This money clip is MONEY. Quality surpassed my expectations. When I have money in the bank I spend it easier. But, having actual paper money folded nicely and held with this clip makes me think twice about spending. Interestingly, having the Mini Viper money clip has saved me money. It feels good to have my cash in this clip while going through the day. Thanks for the great clip! I bought the mini viper in black diamond a couple months ago, and I have to say it's awesome. I searched and searched for the right wallet/clip and struggled to find the right one. Couple months prior I bought a small front pocket leather wallet, it was nice but did not hold cash well. I finally found this site and researched them all. I was between the mini viper and t-30/60. I chose the mini viper mainly because of its size and I don't regret it. It practically melts in your pocket, half the time I do a quick feel to make sure I have it. I've had 40 bills and 4-5 cards in it at times but regularly carry 3 cards 10-20 bills. I am probably going to get a t60 at some point for extra bills and to change it up every so often. One last thing, I'm rough with this clip and have dropped it multiple times and has been thrown by my small kids and still looks great. These things are built to last! I bought one of these money clips about a year or so ago and it is the best I have ever one I have ever owned. It will still hold a one dollar bill on edge. I do believe that once ina while I might have a few more than 30 bills and I have had no problems..Of course that's not reccomended. I’ve had money clips for thirty years, it was always a case of they couldn’t hold enough or couldn’t hold to little. I purchased two vipers had one engraved and more than happy with probably the last money clip I’ll ever need. It does as advertised, compact comfortable, durable and stylish with a little engraving, couldn’t be more pleased. It's like all the others are in the stone ages! I received my first Titanium clip at the Chemical show in NY @ the Jacob Javits center from a vendor. It lasted about 10 years and broke. It was much thinner than the one I bought from you. I'll tell you what... Nothing beats your clips. It's like all the others are in the stone ages. Thanks for a great product! At Superior Titanium we are really fortunate to have some amazing customers. After using a mini-Viper for 18 months Bill B. was kind enough to not only provide a detailed review, but to also take some cool photos of his mini-Viper after a year and a half in his pocket with keys and coins. These are Bill's real untouched up photos and his awesome idea to use his numerous Benjamin 's as a background (why haven't we thought of doing this before?!). "A year and a half ago, I was looking for a replacement for my existing money clip that was woefully inadequate in capacity for my new job that would require a lot of travel. I have always appreciated the joys of titanium and found the Superior Titanium site and the wide variety of clip designs. After a lot of comparisons, I decided on the mini-Viper (30 bills folded - <1/2 inch). The Viper (60 bills folded) was tempting, but I didn 't want to overload my pocket with the twice as large curve (3/4 inch) diameter of the full size Viper. I also decided to get the black diamond model, even though I didn't have many expectations that the coating would survive long in the pocket with my change and sometimes my keys. As I went over my 18 month old 30 bill mini-Viper clip, I noticed a few things... The FIRST thing I noticed was that I had FORTY FIVE folded bills in it! Doh! 50% over spec! I took them out and tried the "one, unfolded, biIl" test and it held on to a single bill!" Last, but certainly not least, is the smoothness - not the smoothness of the clip in the hand, but the clip on the bills! The clip slides on and off the fold of bill with an even resistance and balanced and constant level of force. Smooth to slide off, but not loose or easy. The bills are held in a manner that inspires confidence. The clip slides back onto the bills with the same feel. Both on and off, the action is reminiscent of opening and closing the door of a fine German automobile. Bottom line - I love this clip! I'm looking forward to trying a full size model..."